Twin engines will need to be sourced & fitted separately. 2 x 80 hp is recommended for planing performance. If planing performance is not required, a lower hp can be fitted. A quote for twin engines is available upon request (this will include sourcing & fitting the engines & steering). Please note that if the unit is to be MCA Classed, certain modifications to the petrol fuel tanks may be required. This would need to be discussed with the MCA to determine what they require & would be treated as an additional cost. Operating Bow Door with two separate push buttons in green & red. Safety mechanism to lock bow door in place. Safety feature - bow door will automatically cease lifting or lowering if obstacle or foreign object detected. Considered more cost effective than steel or fibreglass & more resistant to damage from collision & corrosion, this aluminium hulled Workboat & Landing Craft in marine grade 5083 aluminium plate is versatile, strong, light-weight, durable & low maintenance cost. Ideal for the transportation of goods & personnel (easily accessible for those with injury / disability), these models have been previously utilised for harbour debris clearance, removal of waste material from ships at anchor, rescue on flood plains & as an inter-island ferry in British Columbia. This particular example, constructed in 2015 to MCA Workboat Code of Practice, complete with wiring, batteries & operating bow door, has never been used. Twin diesel engines would need to be supplied and fitted separately but 2 x 80hp outboards, with extra long shaft, would enable this vessel to achieve speeds of around 30 knots. 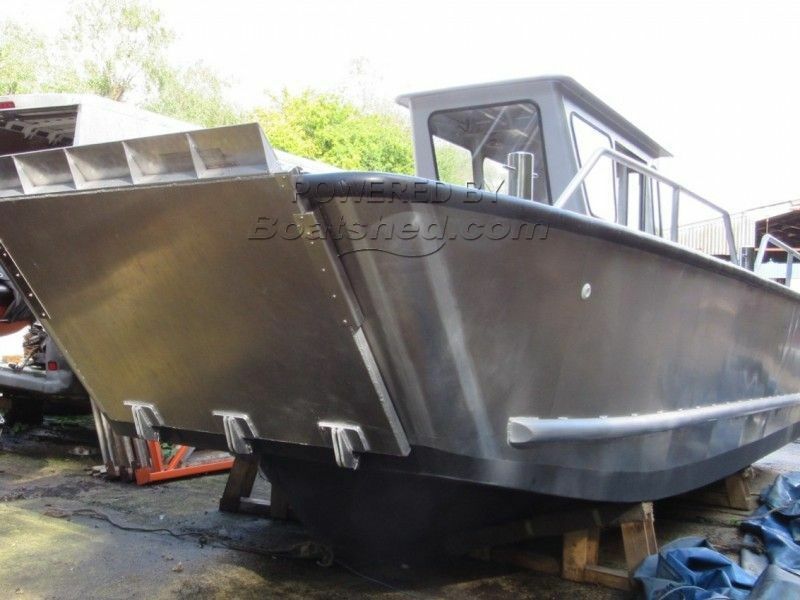 This Landing Craft LC-823 Aluminium Workboat has been personally photographed and viewed by Billy & Jo Hallam of Boatshed Plymouth. Click here for contact details.